Ok so this one is about 8 weeks belated, I know, but I have been quite busy. I had good intention to write a trip report ages back, but of course things don’t always work out the way you plan lol. Anyway, here we are on the 1st March (scary huh?) with a trip report for Walt Disney World Resort Christmas 2008. Now the “Christmas” part is important. We were not there just in December for the Christmas celebrations - we were there AT Christmas. We were there in the Magic Kingdom on Christmas Day! It truly was a magical trip beyond my imagination, and Jon and I loved every second of it. I have always loved Christmas - always - it is my fave time of year. And Christmas at Disney - which I had previously only experienced at Christmas Season (not AT Christmas) at Disneyland Resort Paris some years before - is always an extra special time. Disney just some how “get it” at Christmas, and my expectations of a winter wonderland in Florida did not disappoint. In this report I am going to just talk more about individual aspects of the holiday season there that we experienced, rather than a day by day account. Let it be safely assumed that we took many pictures, went on as many rides and met as many character as humanly possible - just as we always do! Lol. So the sections below are about things that were specific for Christmas or extra special, or new in some way to us. Running twice daily right through the Christmas week, the hugely popular, colourful and extravagant Once Upon a Christmastime Parade did not disappoint! I have to say I loved this parade, it was a welcome break from the worn and tired Dreams Come True Parade that normally graces the streets of the Magic Kingdom. Filled with hundreds of Christmas figures from Reindeer, to Elves to the beloved Disney Characters. It was a long parade too. Also included some fairly rare characters by Disney standards - including Christopher Robin, who Jon and I were lucky enough to meet - more about that later. Clarabelle, Horace, Gingerbread men, Santa, Scrooge - they were all there. Once again, taking a welcome break from regular Wishes, Holiday Wishes sparkled into the Magic Kingdom skies by night. Narrated by Jiminy Cricket (this little guy gets everywhere in WDW! ), the various acts unfold and you are treated to a grand spectacular of Disney fireworks. I personally loved the Oh Christmas Tree part of the show when Cinderella Castle is shrouded in green, and green fireworks shoot up the sides of it, making it look like a giant Christmas Tree. Staged in the now defunct Galaxy Palace Theater, this adaptation of the classic tale had of course a Disney twist. Rockin’ Reindeer, Sanata Goofy and a whole host of other festive treats abound, and made for a pretty neat show. I liked this show and loved seeing the unique characters and new outfits for old favourites. A big scale stage production at Cinderella Castle with great music, effects and hundreds of characters and performers. Lots of carols and songs for the festive season. It was a pretty neat show and especially pretty at night when the Castle lights were on. There was a Sugarplum Fairy and Nutcracker sequence, Frosty the Snowman, and some weird Chinese thing from Chip n Dale LOL. Again, many new and unique characters and outfits. I especially loved Nutcracker Mickey *wants to meet nutcracker Mickey* lol. A short small show at the Castle stage nightly at sundown where Mickey and the gang summon the help of the fairy Godmother to decide what to do with the castle for the holidays. In the end, the Fairy Godmother declares it to be Cinderella’s choice - seeing as she lives there - and the castle is lit up like a giant glass slipper. At EPCOT for the holiday season the countries around World Showcase took on the spirit of the season and every country held audiences with their own versions of their festive figures, legends ad storytellers. We were lucky and managed to get round to 9 of the 11! Overall IllumiNations at EPCOT was the same, but at the end for the holiday season they tag on a special holiday part. It isn’t anything amazing, just a small extra piece of narration, and some extra fireworks. But all the same, we saw it. At EPCOT’s Future World, just in front of World Showcase Lagoon they had the giant Christmas Tree, with greetings on it from all over the world, and the Lights of Winter. The Lights of Winter are very pretty and cool. The multicoloured lights dance to a holiday soundtrack, and overall are very impressive. Over at American Adventure the biggest performance of the year at EPCOT is held at the Garden Theater. A full orchestra, a celebrity narrator, WDW Cast Choir and an outside choir all tell the story of Christmas in good Christian fashion. Even if you aren’t religious, or aren’t Christian, it is a beautiful production, and VERY popular. The lights, the music and the choir are all amazing. Very festive, and very heart warming. Taking a break from the regular Jammin’ Jungle Parade, Jingle Jungle Parade is essentially the same but with that Christmas twist from Disney. The characters don some festive outfits, and the floats get a holiday makeover (presents, garlands, toys etc) and the soundtrack is given a Christmas makeover too. I love Jammin’ Jungle, and Jingle Jungle made it that much more magical. I love Jingle Jungle now just as much, and thought that it was a pretty meat parade. Over in the Magic Kingdom we were able to meet Tree Farm Donald Duck, Scrooge McDck and Santa Claus himself! They were of course only out for the holiday season. Donald’s Tree Farm was cool, and made a nice welcome change of backdrop for character pictures. All week the signs advertise trees for sale, but on the 26th (the day after Christmas of course) the keen eyed will notice sale signs go up!! A neat detail and a cool meeting area for some unique characters! Santa’s special meeting area was set up down in Town Square next door to City Hall, and had a Christmas countdown which displayed 000 on Christmas Day, and 365 on the 26th! One day we had a Character Breakfast at the Polynesian. We met Stitch, Lilo, Mickey and Pluto all in the best Hawaiian clothes. I love the Polynesian, and the breakfast there is superb. It is “family style” - which to my European friends means it’s basically buffet - but they bring it all to your table! YUM! In the Animal Kingdom the holiday season continued with not just the decorations and the parade, but the characters too. In Camp Minnie-Mickey you could meet all your favourites in their holiday best! We managed to meet Santa Goofy and Christmas Mickey, Minnie, Chip, Dale and Donald. Over at the Character Landing we also met Pooh, Eeyore and Tigger all in their holiday best! Also out apparently just for the peak time was the ever elusive and very rare Brer Rabbit, which Jon and I was extremely pleased to meet! We also met Governor Ratcliffe, another one elusive to WDW. Being peak season all the Citizens of Main Street were out in force, and we were lucky enough to meet 5 of the Society Ladies, Fire Chief Smokey Miller and Mayor Weaver. People, meet Lolly the elf, Snowflake, Pooh, Eeyore, Santa, the Fairy Godmother, and a very special boy named Christopher Robin! When at Hollywood Studios we were able to meet the brand new Disney Characters to join the line up - Bolt, Mittens and Rhino from the new Walt Disney Pictures production Bolt. We got our photo with them, and got their autographs too. They had PhotoPass photographers, so we were able to get pictures with special borders too - including a Bolt one. The yearly tradition over at Disney’s Hollywood Studios continued this year in spectacular fashion. The Osborne Family Spectacle of Dancing Lights are stunning. Like I said before, I LOVE Christmas, and the Osborne lights are nothing short of pure Christmas magic. The lights dance to the music in amazing colourful patterns - and at certain intervals snow falls from the sky! I loved the Osborne Lights and look forward to seeing them again. Jon and I had met all 5 Fairies at the exclusive pass holder preview in September last year, and so hadn’t actually been into Pixie Hollow despite having met all 5 Fairies! So we made a point of going there numerous times. Pixie Hollow curiously is located in the Toontown Hall of Fame tent over in Mickey’s Toontown Fair at the Magic Kingdom. An interesting location to say the least. Overall the whole experience is pretty cool. But I do think we were led to believe it was going to be something really extra magical. The painted walls along the shorter than expected “shrinking hallway” and the dark, very false looking pixie room were somewhat of an anti climax for me. Also meeting the fairies themselves seemed a very rushed affair and unlike meets with other characters, you didn’t seem to be able to spend a lot of time interacting with them. Overall a cool experience, and one we will have to do again in order to meet Tink and her pals, but not as magical as they could have made it, in my opinion. In the little garden to the right of the Castle Belle normally does her story time. At Christmas this became an adapted version, retelling the her direct to video outing Belle’s enchanted Christmas. The same principle and setup as the regular story time was used, but the story adapted and Belle herself wearing a Christmas cloak. A subtle, but neat change for the holiday season. At the Grand Floridian they had the giant Gingerbread House (which had shockingly NO gingerbread men or cookies!!). Kinda cool to see. For the holiday season there were a number of new PhotoPass locations offered and some neat new Photopass border. Locations included the Grand Floridian Christmas Tree, 2 locations at the Osborne Lights and at the Christmas Shop in the Magic Kingdom. One day we ate dinner at the Contemporary’s new restaurant, The Wave. I have to say it was ok. Nothing special, nothing really outstanding, but just ok. I can’t remember exactly what I had, but I do remember at the time thinking it probably could have been better. The restaurant is kinda dark, very plain, and very “brown” (strange since it is called The Wave). I have no pictures of the restaurant. Jon and I were very pleased that we were able to go over the Christmas period overall - but especially felt lucky because we actually got to see things that we otherwise thought might not be possible. 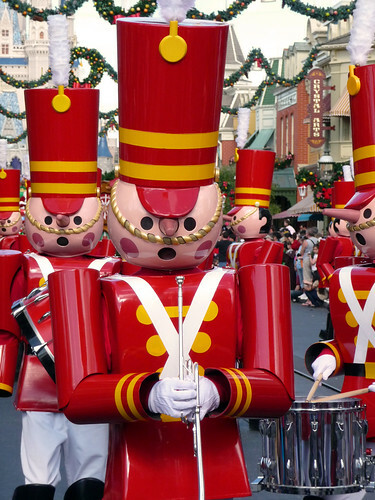 The weeks proceeding Christmas itself, the Christmas parade only runs during the Mickey’s Very Merry Christmas Party’s. As does the 2 shows (Celebrate the Season and Twas the Night Before Xmas). So actually getting to see them as many times as we did - and in daylight (which is far better for lighting and photographing them!) certainly was a bonus. The other thing we got to do that otherwise is normally only at the Xmas parties is rto meet Tree Farm Donald and Scrooge McDuck. Scrooge is considered pretty “rare” at WDW normally, and to meet him in regular park hours was cool. The final thing we were happy about was the fact they still had a lot of MVMCP merchandise left over, such as the t-shirts and pins. So we managed to get some of those too! So overall we had the MVMCP experience - albeit in the longer, warmer daylight with more time to do our own thing in between.